From all the team here at Great Outdoors, we want to take a moment to wish you the happiest of Christmases and a wonderful start to 2019. We’re excited for the year to come and hope that we can continue to share adventures with you. We’ll see you when we get back from all our festivities on December 27. But we promised one last surprise up at the end of the countdown our ho-ho-holiday sale! 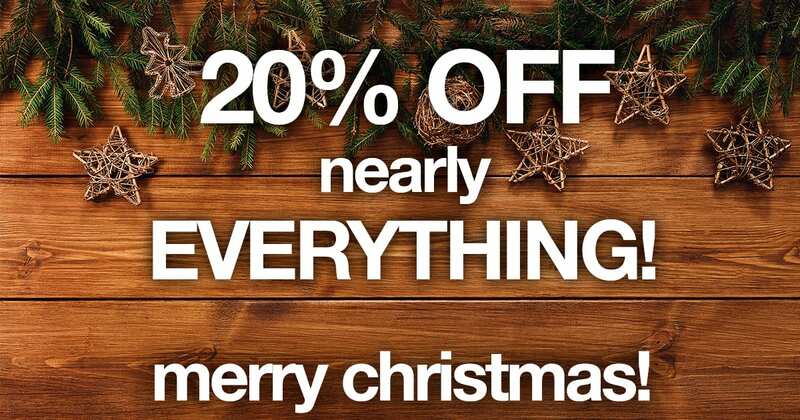 We’re closed on Christmas and St. Stephen’s Day, but are offering 20% off nearly* everything online! Items bought online might not be delivered until the first week of January but you can always choose click and collect or visit us in-store during our Christmas hours! Use the code XMASDAYSALE on checkout to get the 20% off discount. *Our XMASDAYSALE discount applies to nearly everything online while we’re closed for our Christmas break. It excludes sale items, vouchers, tickets, kayaks, GPS and fitness tech. Please be aware that items ordered during the promotion, from 5:00pm on Christmas Eve until 10:00am on December 27th, may not be shipped until January 2nd when our courier comes back after their Christmas break. If you have any trouble making your order, please email orders@greatoutdoors.ie and we will respond to you as soon as possible on the 27th and we will do our best to honour the applicable prices. Please be aware that sometimes due to bugs and gremlins, the item that you ordered may be unavailable but we will try to offer you a better product at no extra charge or cancel and refund your order immediately if that is what you’d prefer.